Table 17.5 Causes of neutrophilia. ET, essential thrombocythaemia; PV, polycythaemia vera. 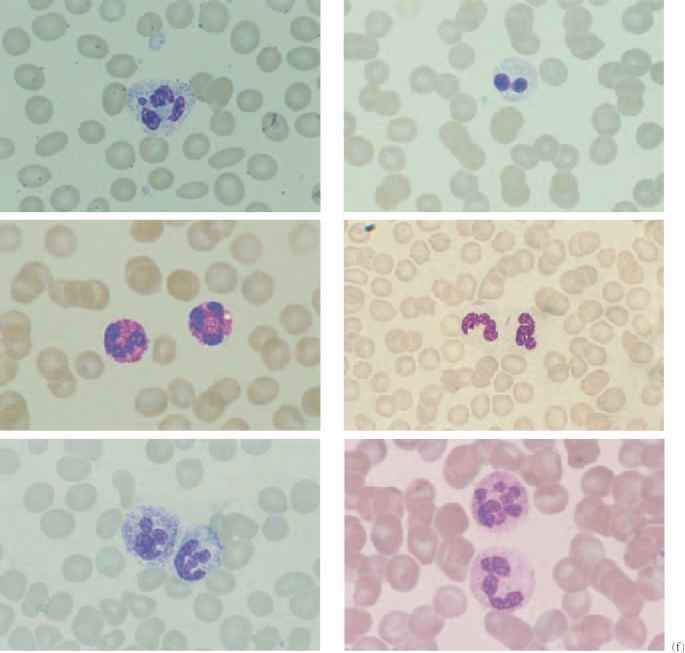 granulation within the cytoplasm (Figure 17.5), as well as a 'left shift' (with presence in blood of myelocytes, metamyelocytes and band forms) and an elevated leucocyte alkaline phosphatase score (compared with a low score in chronic myeloid leukaemia, CML). In contrast with acute leukaemia, there is an orderly maturation and proliferation of all normal myeloid elements in the bone marrow. Leukaemoid reactions have been described in patients with osteomyelitis, empyema, septicaemia, tuberculosis, Hodgkin's disease, juvenile rheumatoid arthritis and dermatitis herpetiformis. Leucocyte adhesion deficiency (LAD) is a congenital disorder, presenting with persistent leucocytosis, delayed separation of the umbilical cord, recurrent infections, impaired wound healing and defects of activation of neutrophils. The condition is caused by defects in adhesion of neutrophils to blood vessel walls. As a result, phagocytes do not migrate from the bloodstream to sites of infection. Two types of LAD have been described. In LAD-I, mutations of the gene encoding the P-subunit of the P2-integrins (CD11b and CD18) have been detected. The molecular basis for the rare LAD-II is defective glycosylation of ligands on leucocytes recognized by selectin family of adhesion molecules. Clinical features in the two types are similar and, due to the defect in neutrophil migration, abscesses and other sites of infection are devoid of pus despite the striking neutrophilia. Treatment involves the use of prophylactic antibiotics and aggressive therapy of periodontal disease. Stem cell transplantation can be considered in patients with severe disease. 20 X 109/L to 70 X 109/L as well as splenomegaly, widened diploe of the skull, and a high leucocyte alkaline phosphatase but without serious medical problems. Neutrophil function and adhesion to vessel walls in these patients are normal and the condition appears to have an autosomal dominant inheritance. Chronic idiopathic neutrophilia is an association of a chronically elevated neutrophil count (in the range of 11 X 109/L to 40 X 109/L) in healthy individuals without any associated clinical problems. In one series, several individuals were followed for up to 20 years without developing any disease. Leukaemoid reactions have been described with congenital disorders such as amegakaryocytic thrombocytopenia, tetralogy of Fallot, dextrocardia with absent radii and in patients with Down's syndrome. The neutrophilia in Down's syndrome patients is transient but may be exaggerated in response to stress. A syndrome of growth retardation, hepatosplenomegaly and leucocytosis has been described as familial myeloproliferative disease with some affected individuals dying in early life and others remaining stable or even improving with time. These patients had low LAP scores and no detectable cytogenetic abnormality. Others have reported families with several generations of affected individuals with a variety of myeloproliferative disorders but without cytogenetic abnormalities. Familial cold urticaria and leucocytosis is a syndrome of fever, urticaria, rash and muscle and skin tenderness on exposure to cold, which appears to be dominantly inherited. The onset of the disease is in infancy with urticaria, rash and leucocytosis generally occurring several hours after cold exposure. The skin rash is histologically characterized by intense infiltration by neutrophils. Figure 17.5 Variations in neutrophil morphology. (a) Barr body, a drumstick appendage to the nucleus. (b) Pelger-Huet anomaly with a bilobed nucleus. (c) Alder-ReiHy anomaly with prominent purple granules (also in monocytes and lymphocytes). (d) May-Hegglin anomaly with Döhle bodies in the cytoplasm. (e) Toxic granulation. (f) Neutrophil with nuclear hypersegmentation and a normal neutrophil. (g) Chediak-Higashi syndrome with giant granules. 80 X 109/L. Growth factors such as G-CSF, GM-CSF and Neu-lasta (a pegylated form of G-CSF that prolongs its half-life in circulation) are commercially available and are used commonly to reduce the duration of neutropenia associated with chemotherapy and to mobilize stem cells for transplantation. Their use in healthy individuals for the latter purpose is associated with significant neutrophilia and a left shift. Table 17.6 Causes of neutropenia. Altered distribution Drugs Stress of more than two standard deviations below a normal mean value. There is a variation of neutrophil counts amongst different ethnic groups, with black people generally having slightly lower counts (lower limit of normal 1.2 X 109/L) compared with white people (lower limit of normal 1.5 X 109/L). The lower count in black population has been attributed to a relative decrease in the size of marrow storage pool. In patients whose neutropenia is related to decreased production, the propensity to develop infections is directly related to the degree and duration of neutropenia. On the other hand, in patients whose neutropenia is to peripheral destruction or margination of neutrophils, there is no direct correlation between the degree of neutropenia and the propensity for infections. Conditions such as marrow failure states and neutropenia associated with chemotherapy can predispose patients to severe life-threatening infections, although this is more likely in patients with neutrophil counts below 0.5 X 109/L. Common organisms encountered in this setting are Staphylococcus aureus, Pseudomonas aeruginosa, Escherichia coli and Klebsiella species. On the other hand, patients with some congenital or immune forms of neutropenia can tolerate low counts for prolonged periods without any apparent increase in the incidence of infections. Several well-defined inherited syndromes associated with neutropenia have been described. Moderate, asymptomatic neutropenia associated with specific ethnic groups such as American black people and Yemenite Jews has dominant inheritance. Kostmann's syndrome or infantile agranulocytosis is characterized by early onset of severe, recurrent infections, neutropenia and maturation arrest of myelopoiesis at the promyelocyte stage. Defects of granule production have been described in some patients. Both autosomal recessive and dominant inheritance, as well as sporadic cases, have been described. Recent studies have detected different inherited or spontaneous point mutations in the neutrophil elastase gene. Other reported abnormalities include deficiency of antibacterial peptides, which correlates with the degree of periodontal disease. Development of additional genetic defects during the course of the disease, such as G-CSF receptor and ras gene mutations, and cytogenetic aberrations, indicates an underlying genetic instability. Progression to acute myeloid leukaemia (AML) and myelodysplastic syndrome (MDS) has been reported and may be associated with the mutations of G-CSF receptor gene. The majority of patients (over 90%) respond well to G-CSF, with a reduction in incidence of severe infections and use of intravenous antibiotics. It is plausible that G-CSF may accelerate the propensity for MDS/AML in the genetically altered stem and progenitor cells, especially in those with G-CSF receptor and ras mutations (82% and 50% of patients who transform, respectively). However, no association between the dose or duration of G-CSF therapy and malignant transformation has been identified and it is more likely that G-CSF may simply be an 'innocent bystander' that corrects neutropenia, prolongs patient survival and allows time for the malignant predisposition to declare itself. Haemopoietic stem cell transplantation should be considered particularly in those with a poor response to G-CSF. Cyclic neutropenia is a rare, dominantly inherited disorder with variable expression, which is characterized by repetitive episodes of fever, pharyngitis, stomatitis and other bacterial infections attributable to recurrent severe neutropenia occurring every 15-35 days. 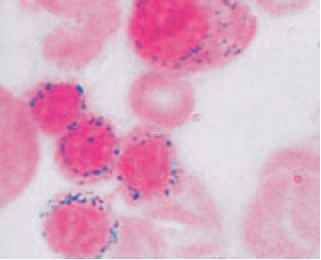 The nadir neutrophil count, usually between zero and 200 X 109/L, lasts 3-7 days and is frequently associated with monocytosis. Cycling of red cell and platelet production is also observed in some cases. The bone marrow is characterized by transient arrest at the promyelocyte stage before each cycle. Both childhood and adult onset have been reported. Recent studies have shown that autosomal dominant and sporadic cases of this disease are due to a mutation in ELA2, the gene for neutrophil elastase (a chymotryptic serine protease of neutrophil and monocyte granules), located at chromosome 19p13.3. This enzyme is synthesized in neutrophil precursors early in the process of primary granule formation. A hypothesis at present suggests that the mutant neutrophil elastase functions aberrantly within the cells to accelerate apoptosis of the precursors, resulting in oscillatory production. The disorder is effectively treated with G-CSF, and no transformation to AML or MDS has been in these patients, with or without G-CSF therapy. Schwachman-Diamond-Oski syndrome is an autosomal recessive disorder characterized by exocrine pancreas insufficiency, metaphyseal dysostosis and bone marrow dysfunction. Recurrent severe bacterial infections and susceptibility to leukaemia are the major causes of morbidity and mortality, although many affected individuals have relatively few problems with infections. Neutrophil count is commonly less than 500 X 109/L and many patients are also anaemic and thrombocytopenic. Bone marrow is usually hypoplastic and a number of neutrophil functional disorders such as chemotactic defects may be present. A variety of physical anomalies including short stature, strabismus, syndactyly, cleft palate and microcephaly may exist. The propensity to develop leukaemia and aplastic anaemia suggests that a stem cell defect may be present. Treatment involves the use of G-CSF in patients with recurrent infections, and the use of pancreatic enzyme supplements for the gastrointestinal insufficiency and steatorrhoea. Some anaemic patients respond to steroids. Reticular dysgenesis is associated with neutropenia, lymphoid hypoplasia, and thymic hypoplasia with normal erythropoiesis and megakaryopoiesis. Patients have a hypoplastic marrow and low levels of IgM and IgG and die from overwhelming infections usually in early infancy. Dyskeratosis congenita is a rare disease characterized by abnormal skin pigmentation, nail dystrophy and mucosal leucoplakia. More than 80% of the affected individuals develop bone marrow failure, which is the major cause of death. The disorder is caused by defective telomere maintenance in stem cells. The major X-linked form of the disease is due to mutations in the DKC1 gene located at Xq28 and coding for dyskarin, a nucleolar protein (see Chapter 12). Dyskerin is part of small nucleolar ribonucleoprotein particles involved in processing ribosomal RNA. It is also found in the telomerase complex, pointing to a possible link between these two processes. An autosomal dominant form is due to mutations in the RNA component of telomerase. Patients with this form of the disease are more severely affected in the later generations carrying the mutations, possibly due to the inheritance of shortened telo-meres, and may be considered to have aplastic anaemia. Neutropenia has been seen with immunological abnormalities such as hyper-IgM syndrome and X-linked agammaglobulinemia. Hyper-IgM syndrome is an X-linked disorder characterized by lymphoid hyperplasia, low concentrations of IgG and IgA, but high concentration of IgM and severe neutropenia. A genetic defect in the T-cell CD40 ligand has been implicated as the cause of the disease. CD40 ligand is a 39-kDa protein expressed on the surface of activated CD4+ T cells, which delivers contact-dependent signals to CD40-expressing cells: B cells, monocytes, dendritic cells, epithelial cells, endothelial cells and fibroblasts. The loss of interaction between CD40 and its ligand results in an impairment of T-cell function, of B-cell differentiation and of monocyte function. Patients commonly die of overwhelming infections by the age of 5 years unless treated with intravenous immunoglobulin and long-term G-CSF. Chronic benign neutropenia, chronic idiopathic neutropenia and autoimmune neutropenia are very similar in laboratory findings and differ only with regards to age of onset and association with other immune disorders. Chronic benign neutropenia commonly presents in older children or young adults. Patients are usually asymptomatic and have neutrophil counts in the range of 0.2-0.5 X 109/L. Bone marrow examination is commonly normocellular or occasionally moderately hypocellular. They usually have a peripheral monocytosis and often a benign course, although anecdotal cases progressing to acute leukaemia have been reported. Anti-neutrophil antibodies, detected in some patients, are not commonly present but antibodies to the stem cells or other precursors may be the inciting factor in these patients. As these patients generally have a benign course, treatment to increase neutrophil count should be reserved for those who have recurrent infections. Corticosteroids, splenectomy, cytotoxic agents and G-CSF have all been used successfully in this setting. Chronic benign neutropenia of infancy and childhood is probably a related disease, with the majority of patients presenting in the first year of life. There is no familial predisposition and anti-neutrophil antibodies are commonly detected. Furthermore, the neutropenia responds to immunosuppressive therapy, suggesting an immune mechanism. There is a compensatory increase in neutrophil precursors in the marrow. Some patients have a measurable defect of neutrophil mobility, otherwise described as 'lazy leucocyte syndrome'. Infants of hypertensive mothers also commonly have moderate to severe neutropenia lasting for several days. This is probably related to bone marrow suppression. Moderate to severe neutropenia can also occur in newborn infants as a result of transfer of maternal IgG anti-neutrophil antibodies in a manner similar to the rhesus haemolytic disease of the newborn. This isoimmune neutropenia develops antenatally and is due to maternal production of antibodies against antigens on fetal neutrophils. Pure white cell aplasia is a rare condition associated with recurrent pyogenic infections and with thymoma in 70% of the affected patients. There is almost complete absence of myeloid precursors without any abnormality of erythroid or megakaryocyte precursors in the marrow. In the majority of patients, the marrow inhibitory activity is in the IgG and IgM fractions of serum but, in some, the inhibition is due to the lymphocytes. The immunoglobulin is directed against progenitor cells or myeloid precursors. The disorder has been associated with therapy with ibuprofen, certain natural remedies and chlor-propamide. If associated with thymoma, surgical removal of the thymus gland can partially correct the neutropenia. Other treatment options include corticosteroids, cyclosporin A, cyclo-phosphamide and intravenous immunoglobulin. Humoral and cellular immune responses are responsible for the development of neutropenia in a number of settings. Autoimmune neutropenia due to circulating antibody can occur as an isolated condition or in association with other autoimmune disorders such as autoimmune thrombocytopenic purpura and autoimmune haemolytic anaemia. The antibodies may be directed at the mature neutrophils or morphologically identifiable myeloid precursors. tosplenomegaly, jaundice and marrow infiltration with the abnormal clone. They typically have a rapidly progressive course unresponsive to combination chemotherapy. Neutropenia is also associated with collagen vascular diseases such as systemic lupus erythematosus (SLE), and rheumatoid arthritis. IgG or IgM antibodies may be directed against mature neutrophils or their precursors. Recent advances have allowed better understanding regarding the mechanism of neutropenia and improved options for treatment. Target antigens for anti-neutrophil antibodies have been identified for both Felty's syndrome and for SLE. In Felty's syndrome, severe neutropenia is associated with rheumatoid arthritis, splenomegaly and leg ulcers. Therapy for neutropenia with methotrexate and cyclosporin A has been attempted with variable success. The efficacy of both GM-CSF and G-CSF in reversing neutropenia and decreasing the risk of infections in Felty's syndrome and SLE has been well documented. Of concern, however, have been flares of symptoms or development of leucocytoclastic vasculitis in some patients following the use of these cytokines. Recent results suggest that G-CSF should be administered at the lowest dose effective at elevating the neutrophil count above 1.0 X 109/L. Drug-induced neutropenia is probably the commonest cause of isolated neutropenia. A thorough evaluation of the medication history of a patient with neutropenia is important for excluding drugs as the inciting factor. The mechanisms usually are by suppression of the bone marrow or immunological. The neutropenia commonly develops 1-2 weeks after initiation of the drug and resolves soon after discontinuation of the offending agent. Agents most commonly associated with this side-effect include antibiotics (such as penicillins, cephalosporins and chloramphenicol), anticonvulsants (e.g. carbamaze-pine and phenytoin), anti-inflammatory agents (e.g. gold, phenylbutazone), antithyroid drugs (e.g. carbimazole, methyl-thiouracil), hypoglycaemic agents (e.g. chlorpropamide), diuretics (e.g. hydrochlorothiazide, bumetanide) and phenothiazine. Cytotoxic agents used in cancer therapy are well known for this complication. Other miscellaneous causes of neutropenia include viral infections (HIV, varicella, measles, rubella, infectious mononucleosis, influenza, hepatitis A and B, parvovirus and cytomegalovirus), overwhelming bacterial infections (by exhausting the neutrophil reserve pool), metabolic diseases (such as orotic aciduria, methylmalonic aciduria and glycogen storage disease type Ib), nutritional deficiency (deficiency of vitamin B12, folate causing also hypersegmented nuclei - Figure 17.5 - or copper) and with hypersplenism. A number of congenital and acquired conditions with abnormal neutrophil morphology (Figure 17.2a) and/or function have been recognized (Table 17.7). Some of these are associated with abnormal neutrophil numbers and were discussed earlier. Table 17.7 Disorders of neutrophil morphology and/or function. Chediak-Higashi syndrome is a rare autosomal recessive disorder characterized by oculocutaneous albinism, recurrent and severe bacterial infections, giant blue-grey granules in the cytoplasm of white blood cells (Figure 17.5f), a mild bleeding diathesis, progressive peripheral neuropathy and cranial nerve abnormalities. Morbidity results from patients succumbing to frequent bacterial infections or to an 'accelerated phase', a progressive lymphoproliferative syndrome. Patients eventually succumb to a profound pancytopenia. Neutrophils contain a highly inhomogeneous population of giant granules probably derived from coalescence of azurophil and secondary granules. The giant granules are seen more commonly in the bone marrow than peripheral blood, as many of the abnormal myeloid precursors are destroyed before release, leading to moderate neutropenia. Neutrophils also have a deficiency of antimicrobial proteins as well as disordered degranulation and chemotaxis. 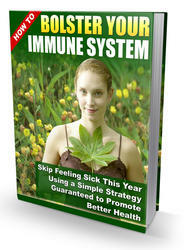 Dysfunction of other elements of the immune system such as the cyto-toxic T lymphocytes and natural killer cells contribute to the propensity for infection and the development of the accelerated phase of the disease. Mutations in the lysosomal trafficking regulator, or CHS1/LYST gene, located on chromosome 1q43, have been implicated as the cause of this disease. At present, treatment for the disorder is stem cell transplant, which alleviates the immune problems and the accelerated phase, but does not inhibit the development of neurological disorders that grow increasingly worse with age. Chronic granulomatous disease (CGD) is an inherited disease characterized by severe and recurrent purulent bacterial and fungal infections, including pneumonia, lymphadenitis, hepatic abscesses and osteomyelitis. The majority of patients present in the first year of life with infections with catalase-positive organisms. Phagocytic cells of CGD patients are unable to produce superoxide anions, and their efficiency in bacterial killing is significantly impaired. In addition, a failure to switch off the inflammatory response leads to the formation of granules. All the subtypes of X-linked CGD are caused by mutations in the gene for the gp9l-phox subunit of cytochrome b (CYBB) located at the XP21.1. There is a significant heterogeneity in the mutations in the gene, with most being family specific. This accounts for the clinical heterogeneity seen in the X-linked CGD. Other mutations in recessively inherited forms of the disease have also been described. sulphamethoxazole. Recombinant human interferon-y may augment the host defence and reduce the incidence of life-threatening infections by unknown mechanisms other than reversing the respiratory burst defect. Haemopoietic stem cell transplantation, if performed at the first signs of a severe course of the disease, is a valid therapeutic option for children with CGD having an HLA-identical donor. Myeloperoxidase (MPO) deficiency is the most common inherited disorder of phagocytes and is inherited in an autosomal recessive manner. The gene encoding for MPO is located at 17q22-23 near the breakpoint of the translocation in acute promyelocytic leukaemia. Despite the key role of MPO in the microbicidal function of neutrophils, persons with MPO deficiency lack any clinical symptoms and therapy is not required except for incidences of fungal infections when aggressive antifungal therapy is indicated. Specific granule deficiency (SGD) is a rare congenital disorder characterized by recurrent bacterial and fungal infections of skin and lungs. The inheritance is autosomal recessive and, although the precise molecular defect has not been elucidated, recent data implicate functional loss of the myeloid transcription factor CCAAT/enhancer binding protein, C/EBP(epsilon), as important in the development of SGD. 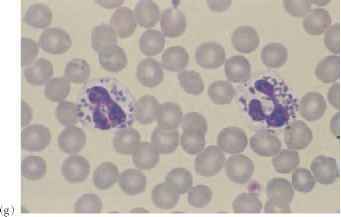 The neutrophils of these patients display atypical bilobed nuclei, lack expression of at least one primary and all secondary and tertiary granule proteins, and possess defects in chemotaxis, disaggregation, receptor upregulation and bactericidal activity. Similar neutrophil granule deficiencies have been described in some patients with leukaemia. This is a rare autosomal recessive disorder characterized by palmoplantar keratoderma and early-onset peridontitis. Pyogenic liver abscesses are an increasing recognized complication. Consanguinity is common and the disease is commonly manifested in the first 6 months of life, with early progressive loss of both primary and secondary dentition. A phagocytic defect in micro-bicidal activity and degradation of ingested material is thought to be present. This is attributed to loss of function mutations of the CTSC gene located on chromosome 11q14-q21, which encodes the protease, cathepsin G.
What could be the cause of more than normal juvenile neutrophils and normal mature neutrophils?